McDonald’s has just released a fantastic video. It epitomizes the quintessential American value of hard work and puts forth huge support for that character trait. In the short clip, a worker gets accepted to college with the help of McDonald’s. They state it is part of their college assistance program and part of being America’s Best First Job. It’s brilliant branding and I have to say I’m impressed. You know who won’t be? Those behind #FightFor15. They are going to hate this ad with a passion. Because they have tried to paint McDonald’s as a big, evil corporation who doesn’t care about their employees. That’s just not true. Many people have begun by working at places like McDonald’s. The trick is, that’s your first job. You are supposed to build up from there, not stay there and stagnate. The cornerstone of click bait is to say how X responds to Y in the “best way possible.” But in this case, McDonald’s really does respond to #FightFor15 in the best way possible with their new spot, America’s Best First Job. If you’ve been keeping up with the movement, you likely noticed a pattern among the activists. 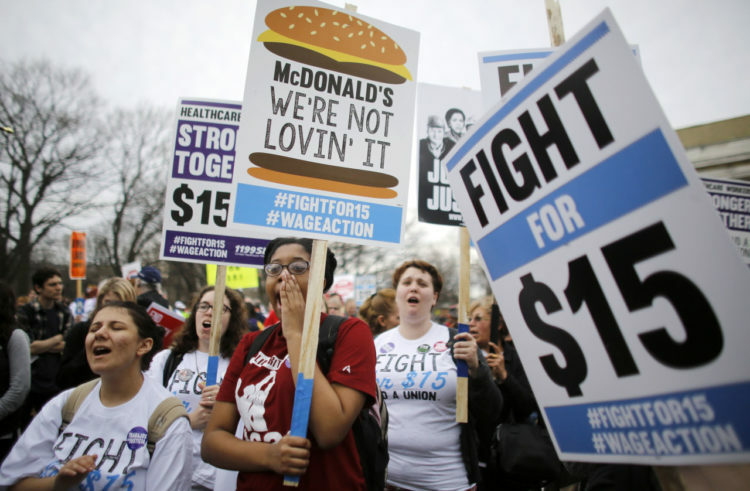 Leftists pushing a $15 minimum wage seem to have locked onto McDonald’s as their main target (see Minimum Wage Hikes Result in McDonalds Closing Doors. We Told You…). McDonald’s just McMelted the faces off of liberals worldwide. The company made its point in a not so subtle way, sure, but they kept it positive. Grilling meat byproduct and pink chicken ooze at McDonald’s isn’t meant to be a career, it’s supposed to be a stepping stone on your way to a grown up job. The thing about minimum wage jobs is they require minimum skills. McDonald’s gets it, you and I get it, even James Franco gets it. The only ones not getting it? Soppy leftist milquetoasts. McDonald’s has less than no patience with these whining protesters and I don’t blame them in the least. Working at McDonald’s was always meant to be a job for kids, so they could find out what a hard work ethic amounted to. It was never meant to be a career move or to feed a family of four. My son, when he started out, worked a fast food job for all of two weeks. Then he went into business for himself programming. He learned his lesson fast. Unfortunately, there seem to be many on the Left who never learn. McDonald’s pays minimum wage to begin with because the required skill set is, well, minimal. As radical protesters keep bullying McDonald’s and others to raise the minimum wage, these businesses are now being forced to automate many of those jobs. No one can afford to pay $15 an hour for this type of work and stay in business. I think what McDonald’s does for kids is fantastic and I love their ad. I love it even more because the Left is having a meltdown over it.